Recommended for Sleep problems like Snoring, Insomnia, and Neck Pain. Sleepsia Shredded Memory Foam Pillow is highly-recommended for those with sleep problems like Snoring, Insomnia, and Neck Pain. Also, it is the ideal pillow for those frustrated having discomfort and uneasiness feeling while sleeping. Outer bamboo (35%) and polyester (65%) cover with a comfy great soft jacquard fabric which is breathable, anti-bacterial, odor-free, hypoallergenic, and machine washable. A highly popular brand in the USA, certified for its quality and for offering greater breathability & Eco-friendly material. Sleepsia is making its mark in the Indian market and globally. 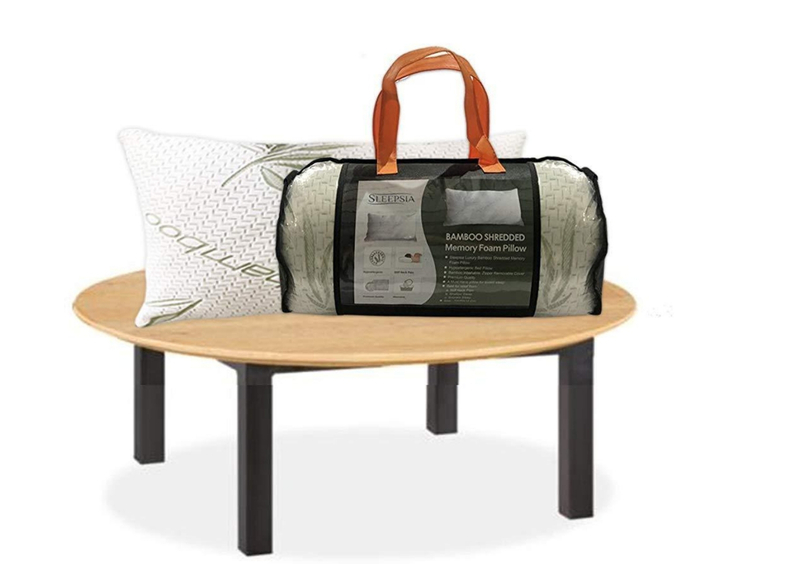 The knit zippered cover lets you open the shredded filling to alter and customize the pillow’s firmness, height, loft, and support depending on your sleep position and needs. 30 Day "No Hassle" Return, Fast and free delivery, Free Return Shipping, Guaranteed Refund, Affordable irrespective of financial status. One year of warranty period in each product with 100 rupees flat off for the first time order with additional discount and offers. Data shows that 51% of adults globally don’t get sufficient sleep and average sleep hour at night is decreasing. In 1942, the average of 8 hours of sleep was the norm, but now it has come down to 6.8. Japan has the lowest average sleep with 5 hours and 59 minutes. This sleep deprivation leads to end number of severe health issues like Snoring, Asthma, depression, allergy, Insomnia, back pain, cancer, breathing problem, tension, early death, Neck Pain, & Migraines etc. Therefore, rectifying the root of the problem and gaining sufficient sleep is very essential. This requires a special focus on the sleeping ingredient for sleeping i.e. a comfortable pillow which works as a therapeutic solution. Sleepsia has very deeply researched each issue and designed an tremendously extra-ordinary pillow to offer comfort and sufficient sleep. Sleepsia Shredded Memory Foam Pillow is among the most-liked pillow collection for its tremendous support and firm material that never goes flat. Shredded memory foam allows you to shape the pillow according to your requirement irrespective of your sleeping position. This is Eco-friendly and free from chemicals and dust-mint to ensure absolute safety. 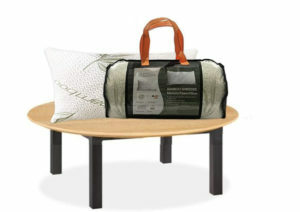 Eco-Friendly: This pillow is made up of high-quality material with luxurious and anti-bacterial knit covers. It is extremely eco-friendly and durable, besides being soft, luxurious and adaptable. The combination of bamboo fibers and memory foam makes this pillow highly loved and highly recommended to have sufficient sleep. Great for Pregnancy Support: The additional firm support and flexibility of the shredded foam is ideal for pregnant women too. It lets pregnant women adjust shape according to their bodies to have absolute belly support, also supports the back for a comfortable sleeping position. Sleepsia Shredded Memory Foam Pillow is Hypoallergenic and dust-mint resistant with natural thermoregulation. The Synthetic Visco-elastic foam and pressure point relief ensures to keep you away from all sleep issues. It is firm and thick that won’t flatten as you shift positions while sleeping. In fact, all sleeping positions need the right type of support to the back, neck, and shoulder. The space between the pillow and your head caused by the gap between neck and shoulder makes it difficult to keep your spine aligned. The shredded foam allows air to pass through every part so that no heat is captured at night while sleeping. The high airflow also keeps bacteria and moisture out for a better sleeping atmosphere. 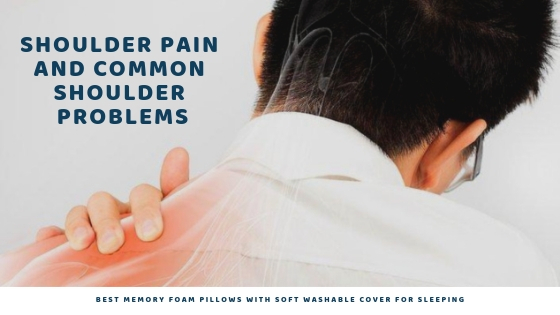 Shredded memory foam allows you to form the pillow matching to your needs, and even helps in sleeping on your stomach or back stomach comfortably, something that can be complex to do with a solid foam pad. Sleepsia is a leading brand in the USA and has now expanded to other countries like India. Sleepsia ensures to deliver a reliable and high-quality product to propose a wonderful sleeping experience. We have made the delivery and communication process hassle-free with 24x7 helpline service. Sleepsia is known for highly durable and premium-quality material to provide a therapeutic solution for sleeping disorders. Our product has one year of warranty period and exciting discounts which users can avail while purchasing. For some reason, if the customer has some issue with the product; we have a user-friendly and smooth returning policy within 30 days and cash back within 3-5 working days. Sleepsia also has a convenient exchange policy and a platform where you can contribute, participate and suggest a better idea. You can also get health tips and suggestions to sleep better. We also make sure that Sleepsia delivers total support, firmness, comfort, satisfaction and relaxation. Call on 1800-862-1084 to know about different premium Sleepsia pillows at huge discounts.